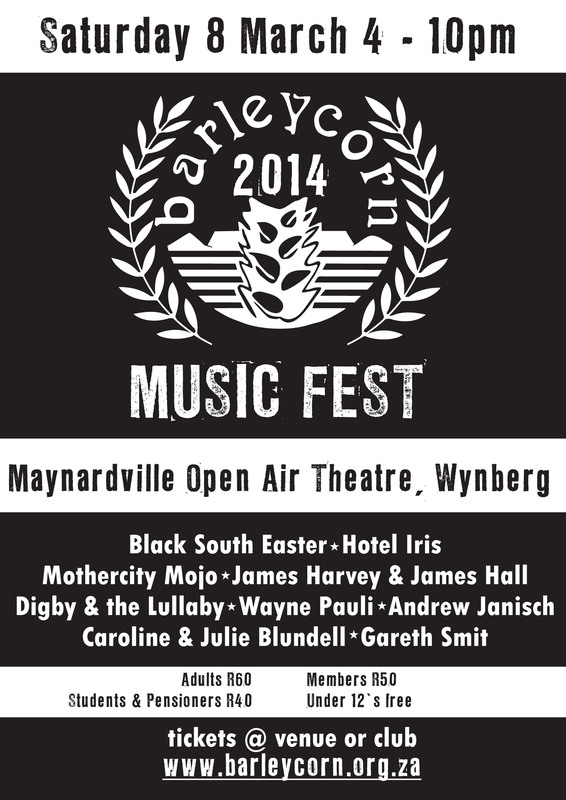 This weekend (8 March 2014) you can catch the Annual Barleycorn Music Festival at the Maynardville Open Air Amphitheatre from 4pm. This year the event will feature: Black South Easter, Hotel Iris, Mothercity Mojo, James Harvey and James Hall, Digby & the Lullaby and much more. Tickets are R60 for adults (under 12’s enter for free) and are available at the venue or via the Barleycorn Music club. Barleycorn’s principal function is to promote & present the best local, original music. Over the years, the Barleycorn has played a role in the musical careers of a number of now household names. David Kramer recorded his first album ‘Bakgat’ at the club in 1980 and others who’ve enjoyed our support include Amapondo, Flat Stanley, Freshly Ground, Steve Newman & Tony Cox amongst a very long list!